Before I had my daughter, I had a ‘no regrets’ attitude. I mean, sure, I had moments in which I said or did something I wished I could take back, but I can’t say I spent a heck of a lot of time feeling badly for being myself. I just didn’t see the point. But the moment my husband and I decided to pull the goalie and start trying for kids, the mom guilt started. I felt guilty when it took 9 months for me to get pregnant, took full responsibility for the miscarriage we endured 6 weeks later, and have been apologizing for things left, right, and center ever since. …for not enjoying the first, sleep-deprived year of motherhood. …for enrolling my child in preschool so I could get a break 3 mornings a week. …for every cut, bruise, scrape, and illness she’s ever experienced. …for letting her play on her iPad too much. …for not taking enough pictures. …for taking pictures when I should just be experiencing the moment. …for hiring babysitters so my husband and I can go out for dinner once in a while. …for not getting on the floor and playing with her enough. The funny thing is, the logical part of my brain fully recognizes that these feelings of mom guilt are completely unjustified, and I’ve been a mom long enough to know I tend to blow things out of proportion (and engage in more self-blame) when I’m tired and overwhelmed. When I eat healthy, exercise, get enough sleep, and prioritize self-care, I’m much better at letting those familiar pangs of guilt roll off my back. But since motherhood is messy and unpredictable, and I never know what’s going to happen from minute to minute, let alone day to day, it’s hard to maintain a good work life balance. How do we get over the mom guilt once and for all? I wish I had an easy answer, but experience has taught me that learning how to let things go takes time and practice. It’s not a skill we can magically learn overnight, but the more mindful we are, the more successful we’ll be in figuring out a way to enjoy motherhood without the self-inflicted emotional baggage it tends to bring along with it. Working mom guilt is something MANY of us are familiar with. Some of us have to go back to work to help pay the bills even though we’d prefer to bask in the glory of being a stay-at-home mom, whereas others choose to go back because they love their career and/or have learned that staying home taking care of tiny humans simply isn’t something they are good at. Whatever the reason is behind your current employment situation, embrace it and stop apologizing for it. Whether you’re working for a pay check or self-fulfillment (or both), the trick to banishing working mom guilt is to find ways to have a better work life balance. Here are 8 tips to help. Learn to say no. As much as we want to be everything to everyone, the truth is that we are only human. There are only so many hours in the day and we need to be better about setting boundaries with our time so we can prioritize more important things like sleep and self-care! Try not to hide behind excuses. Your friends and family will respect you much more (and offer help where they can) if you’re open and honest with them when you’re feeling overwhelmed and can’t follow through on commitments. Delegate. As moms, we have a tendency to try and do everything ourselves. It’s just in our nature to do this, and as much as we love having control over every facet of our lives – and the lives of our children – learning how to let go and allow others to take care of the little things is essential to our well-being, especially when we’re struggling to maintain a healthy work life balance. Assign age-appropriate chores to your kids, and outsource the things you don’t have time for. Unplug. When you’re spending time with your kids, make it a point to turn off your computer and smartphone, and forget about Facebook, Twitter, and Instagram so you can focus on the here and now. Your emails and social media updates will be waiting for you when you’re ready to turn the noise back on. Sleep more. From improved focus to weight management, the health benefits of adequate sleep are undeniable, and if you struggle with working mom guilt, getting 8+ hours of shut eye is more important that ever. Struggle to find the time to sleep? Consider trading off with your spouse for night wake-ups and sleep-ins, schedule time for naps around your child’s schedule, or hire help so you can catch some extra Zs. Need help falling – and staying – asleep? Stick to a strict sleep routine, amp up your physical activity, limit caffeine and alcohol (LOLOLOL! ), and unplug after dinner. Eat well and exercise. As irritating as it is to hear people preach about the importance of eating a well-balanced diet and fitting at least 30 minutes of physical activity into your day, we almost always feel better when we make good choices in the health and fitness space. Not only do we have more energy, but we also sleep better and enjoy lower levels of stress, and we start to like the reflection that stares back at us in the mirror each morning. Want to lose weight but don’t know where to start? Plan ahead. If you struggle to maintain an appropriate work life balance, another great tip to try is to set boundaries with your time. Set aside 10 minutes every Sunday to write down everything you are responsible for each day for the full 7-day period ahead of you, and then go through your list and categorize each item as Essential, Important, or Unimportant. Next, write out a daily plan in which you prioritize the essential items first and the unimportant tasks second (I use The Productivity Planner to prioritize my days because it is designed specifically to ensure you are focusing on the right things at the right time). All unimportant items should either be delegated to someone else or removed completely. Make sure your daily plan has the right balance of work and home tasks, as well as time to spend with your family and for self-care, and try your best to stick to it! Manage your energy properly. While most of us are good at managing our TIME effectively, I was recently introduced to the idea of managing our ENERGY effectively, and it’s made a huge difference. Once you pinpoint when you are at your most productive – for me, it’s first thing in the morning after I drop my daughter off at school – you must organize your schedule such that you can take advantage of that time to tackle your most important tasks. When done correctly, you will be amazed at how much extra time you have at the end of the day to engage in the other things that would otherwise get pushed off (like spending time with your kids!). Work in batches. ‘Batching’ involves grouping relevant tasks together and tackling them in one go, rather than splitting them up over the course of a few days. Many people do this in work settings, but what few people realize is how effective it can be in our personal lives as well. Set aside an afternoon or evening each week to take care of mindless tasks – cleaning, laundry, doctor’s appointments, grocery shopping – so you aren’t constantly borrowing time needed for more important tasks several times throughout the week. While some moms live for weekends and holidays so they can get on the floor and play with their kids, not everyone is wired this way. And that’s okay! There are so many other ways to enjoy motherhood, and sometimes that involves putting yourself before your children. Here are 5 tips to help you learn how to enjoy motherhood, regardless of your parenting style. Live in the moment. One of the BEST tips I was ever given to help me learn how to enjoy motherhood (and banish my mom guilt) is to live in the moments I spend with my child. We live in a day and age where we’re encouraged to over-schedule ourselves and our children as much as possible, and we’re constantly trying to juggle a million things at once. But when we make it a point to turn off distractions and just live in the moment, we will get so much more out of the time we spend with our kids. Keep in mind that this doesn’t mean you need to turn your smartphone off for an entire afternoon – you just need to give 150% of yourself during those one-on-one moments with your child. Schedule quality time with your child. If your mom guilt is fuelled by feeling as though you don’t spend enough quality time with your child, make it a point to schedule it into your daily agenda. You can even take it a step further and create a ‘mom and me’ calendar with your child in which you pick activities to do together every afternoon/evening so that your child has something to look forward to (and knows she will have your undivided attention for a period of time every single day). Remember that this doesn’t need to be a huge time commitment on your part. You just need to be consistent with it and ensure you are living in the moment while spending time with your child. Need simple ways to fit quality time in with your kids each day? CLICK HERE for 75 brilliant, budget-friendly ideas! Get your priorities straight. If you find yourself living in a constant state of exhaustion and overwhelm, feel as though you’re constantly letting someone down, and struggle with never-ending mom guilt, it may be time to make some changes. Remember that you are only ONE person, and that there are only so many hours in the day. Decide which things you value most in your life, and which you can put aside until life calms down, and then plan accordingly. This may mean letting go of certain household chores, volunteering less at your child’s school, or reducing the number of hours you work. Take the guilt out of the equation, OWN whichever decisions you make, and move forward. Make self-care a priority. While it might seem impossible to find the time to work on a hobby or project of your own, finding ways to get some R&R and focus on something you’re passionate about outside of being a parent and spouse can do wonders for your soul. Enroll yourself in pottery lessons, teach yourself how to knit, take a cooking class, book yourself in for a manicure, grab coffee with with a friend, or start a blog! Whatever you choose to do, make time for it. You deserve a break, and will feel much more relaxed and rested afterwards, which will have a positive impact on how you interact with your family. As previously mentioned, getting over mom guilt isn’t an overnight thing. There is no magical formula that will teach you how to let things go and enjoy motherhood in its entirety. There will always be bad days, and your kids will occasionally push your buttons and make you say and do things you will later regret, but there are certain things you can start doing TODAY to lessen the grip those feelings of mom guilt have over you. Determine if your mom guilt is justified. Letting go of mom guilt isn’t easy, but a great first step is to take the time to determine if you should even be feeling guilty in the first place! We have been programmed from an early age to second-guess ourselves and feel badly anytime we do something that is perceived as being selfish, but when we take the time to objectively evaluate the validity of our feelings, we often realize our thought patterns are a bit distorted. Stop fretting over silly things like the number of hours your kids watch TV, organizing a night out with the girls, how many times you’ve ordered takeout in the last week, and the fact that you didn’t contribute to the school bake sale. It’s wasted energy you could spend on something more meaningful and productive. Take stock of all the things you do. Instead of focusing on all of your shortcomings as a mom, do yourself a favor and write down all of the things you do for your kids on a daily basis. While there may be certain things you’re either not good at, or simply don’t have the time for, I’ll bet you more than make up for those things in other areas of your child’s life. Stop comparing yourself to others. One of my least favorite parts of social media is that it is extremely one-sided as most of us only share the positive parts of our lives on our Facebook and Instagram pages. Rather than sharing the things we’re struggling with, we want the world to think our lives are perfect, and while there’s something to be said about focusing on the good instead of the bad, this unrealistic portrayal of motherhood leaves a lot of us feeling…inadequate. My suggestion? Ignore it. We all have our own unique strengths and weaknesses, and instead of competing with the other moms in your life, make it a point to compete with yourself instead. Lower your expectations. Before we become parents, many of us have this picture-perfect vision in our heads of what it will be like. We make promises to do things better than our own moms did, to be patient, fun, and spontaneous, to put all of our child’s needs before our own, to raise kind and polite children…the list goes on and on. But then we actually become parents, and all of those plans go straight out the window, and the mom guilt starts to creep in. Instead of embracing the realities of motherhood, and accepting the cards we’ve been dealt with, we continue to strive towards that picture-perfect life we so desperately wanted for ourselves. If this sounds like you, it’s time to get real. You’re not always going to be a carefree, spontaneous, patient mother, and your kids are not always going to be well-behaved angels. Once you learn to lower your expectations, you’ll see a marked decrease in those familiar feelings of mom guilt. Trust me. Proactively look for solutions. If you find yourself feeling guilty about the same things over and over again, it’s time to put pen to paper and came up with a plan. If you can’t keep up with the housework while simultaneously holding down a full-time job and caring for your children, consider hiring a cleaning lady. If your child cries every time you leave her with a babysitter, maybe it’s time to find someone else she’s more comfortable with (helpful hint: get her involved with the process so she feels more in control). If you find yourself constantly feeling frazzled and short-tempered in the mornings, set your alarm 30 minutes earlier. If you feel like you’re yelling at your kids more than you’d like to, considered enrolling in anger management classes. The point is to stop feeling guilty and do something about it! Stop striving for perfection. Seriously. Just stop. There is no such thing as a perfect mother. Period. Practice gratitude. My final tip to help you let go of mom guilt is to practice gratitude each day. You can make this a family activity whereby everyone shares one good thing that happened to them at dinner each evening, you can organize a gratitude page with some of your friends on Facebook where you challenge each other to focus on the good instead of the bad for at least 5 minutes each day, or, if you’re a more private person, you can use a gratitude journal like The Five-Minute Journal to write down your personal wins each day. Keeping an attitude of gratitude will help you to feel grounded and thankful for the things you have rather than guilty or bitter about the harder moments of your day. While all of us feel mom guilt to some degree throughout our careers as parents, those feelings are most often self-inflicted. We live in a constant state of wanting to do – and give – more to our kids, when the reality is that they are pretty content with exactly what’s in front of them. I hope these tips for figuring out a better work life balance, finding ways to enjoy motherhood, learning how to let things go, and getting over mom guilt prove useful to you! 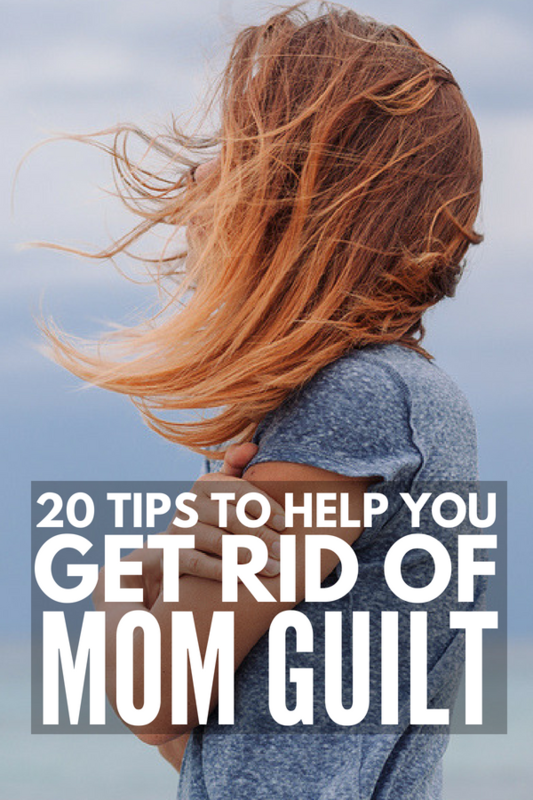 If you found these tips for banishing mom guilt helpful, please share this post on Pinterest. And if you’re looking for more parenting advice, please follow our Parenting board where we share all kinds of helpful tips and tricks we find each day!